It was a long weekend of work. Not that I’m complaining, really. As far as jobs go, we’ve got it pretty cush. Dan and I get the same schedule, we work four ten hour days, so we get three days off a week, and we get to spend all day in a gear shop. But, sometimes, it’s long. We commuted by bike to work three of the days, trying different ways down, and Sunday we did a nice relaxing yoga class after work. The place next to us offers a Yin Yoga – extremely nice, because there is no muscular activity through it, it’s simply stretching. Plus, they give a us a discount! Not bad. That being said, we were still pretty tired by the time we got home. We had thought about doing Mount Toll, but decided against it. Memorial Day? Definitely a time to choose a less popular destination. So, upon arriving home, the very first duty is to pack up all of our gear. No lollygaging around. The number one rule I learned with early morning starts – make it as easy as possible to roll out of bed, into your clothes, and into the car. Otherwise, the likelihood of not going out increases exponentially. Also, never wait to get ready till after dinner – I seem to have a mechanism inside me so that after work, I eat dinner, and immediately start falling asleep – often before I even finish my food. Slightly embarrassing to fall asleep in a delicious plate of spaghetti. The alarm went off rudely early. Honestly, not that early, only 5:45, but after yet another night spent tossing and turning in the heat, it felt too early. After two snooze sessions, Dan dragged himself from bed, and I soon followed suite. I knew I’d feel much better for doing this. It was not long before we were in the car, and headed to the Moffat Tunnel. This trailhead is extremely funny. Most of the time when we come up here in the winter, we about decide to turn around. It’s one of the windiest places around (and Ned is pretty windy, so this is saying something), there’s a train (hence the tunnel part) that has all these fans that start blaring when a train goes by. You sit in the car, windows rolled up tightly, knowing that it is hella cold and windy outside. But if you make yourself get out and ski for ten minutes, you find yourself protected by the trees, and truly it is quite nice. In the summer, it goes through a complete transformation. It seems like a beautiful, benign mountain valley. But I’ve got your number, Moffat Tunnel! You won’t fool me. As per it’s usual, it was beautiful at the trailhead that morning. There were a few cars, but nothing exponential, and soon we were tromping along. “Wet, wet, wet,” I said as I splashed through the little brook that had decided that the trail was the perfect place to run its course. But we do not mind. We pack extra socks for this very reason. You can’t go spring skiing without getting wet. Part of the game. At the trail intersection, it was like a convoy decided to camp there, probably about six tents all set up in the meadow. This is what I was talking about at the beginning of this post: I cannot complain too much about work, since I am lucky enough to have three days off a week every week. For many, that is most uncommon. I’m not gunna lie, I love my life. We turn right, cross on the bridge for the first time since late fall (a nice snow bridge forms here in the winter), and on. We pass a couple, more secluded camp sites, one with a man milling about making coffee. We all do the obligatory exchange, but people go to the mountains to be alone, not to chat. We go on, till we reach another bridge. This one has a gnarly, breakable-looking lump of snow leading on to it, and, with the creek so high, was blackened by water. Early as it was, I suspected it might be frozen, and so very gingerly stepped down onto it. My foot nearly went slipping into the mad crashing current below, and I pulled back. “Super slick,” I informed Dan. Dan decided to give it a try, and concluded the same thing. Well, there was really no reason to cross this creek anyway, we decided, so we headed off the trail and straight up the mountain. The snow was firm in the early morning, but soon we were post-holing more than either of us liked, and so we switched to skis. Following was a complicated weaving through dense pines. This area actually does hold some really nice AT skiing in the winter (most who visit the area are cross country skiers) but it is a bit difficult to find exactly where it is. We finally located the gully we ski in the winter, made harder than normal since we were coming at it from a different angle, and wound our way up. Work had been exhausting, and I was feeling a bit sluggish. Fortunately, Dan and I seem to rotate on the same physical-well-being scale, and he was feeling sluggish as well. 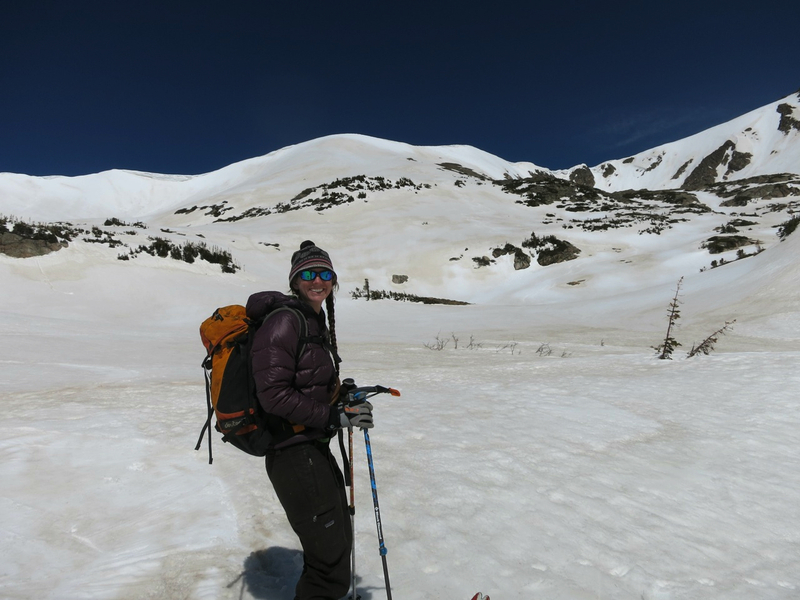 We skinned slowly, letting the movement sweep the work-cobwebs from our bodies, till we reached Arapahoe Lakes. Then the real up started. Frosty is not very steep, just steep enough to make you want to ski it in the winter, but know that you probably shouldn’t. Up, up. Spring skiing is the hardest thing I do. 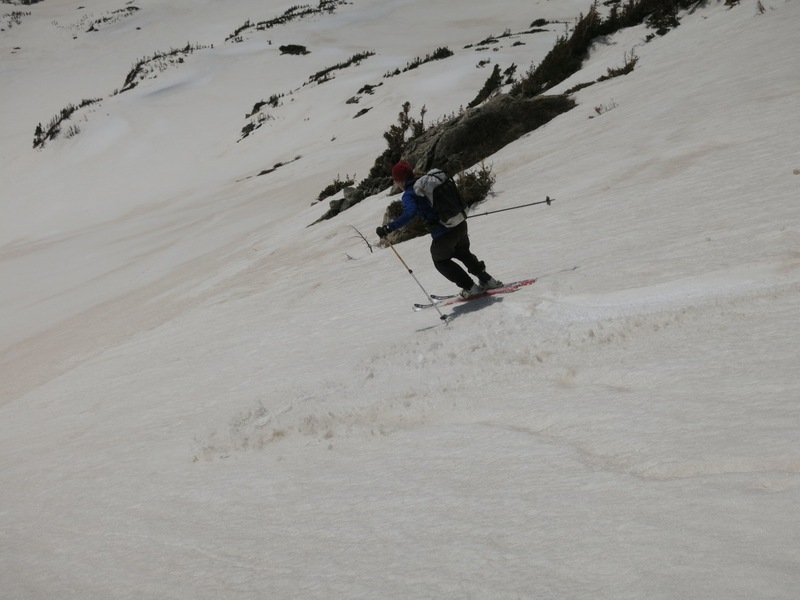 When I first started back country skiing, I thought that was hard. And then I started spring skiing. There is something about the elevation gains (we are averaging about 3,000 feet of elevation gain, whereas in the winter, our average is probably about a thousand to 1,500 feet less), being at higher elevations, the heat, or something that makes it hard. It’s an incredible workout, and often you are done by noon – time to grill a burger, and take care of life business, too. Right beneath the summit, we removed our skis, and booted the last 100 feet or so to the summit. From there, we could see James Peak and South Arapahoe Peak. We had made it a little too early, so we hunkered down, down jackets on, food and water in hand, to wait for the snow to soften. I ate one of my Shot Blocks by Cliff Bar while we waited. Our place of work has been having trouble getting a hold of snacks, and we’ve been resorted to the Shot Blocks. They are gnarly, I’m telling you. They are too big, so you put one in your mouth, and if you’re breathing hard, it can be bad. (I won’t go into detail.) They are incredibly chewy, never seeming to dissolve, until you finally swallow the whole damn thing practically whole. Honey Stinger Chews are definitely my favorite – they don’t freeze like Sharkies (which otherwise are good), they are a better size than Shot Blocks, and they actually give me a kick. I guzzled water, and finally it was time. We clicked in, standing, debating, and then dropped in. Frosty is just fun. It’s mellow, beautiful turns that you can link for a good ways down to the Arapahoe Lakes, and then pick your way down through the trees to the trailhead. A simple ski, good for a post-work -week shakedown. 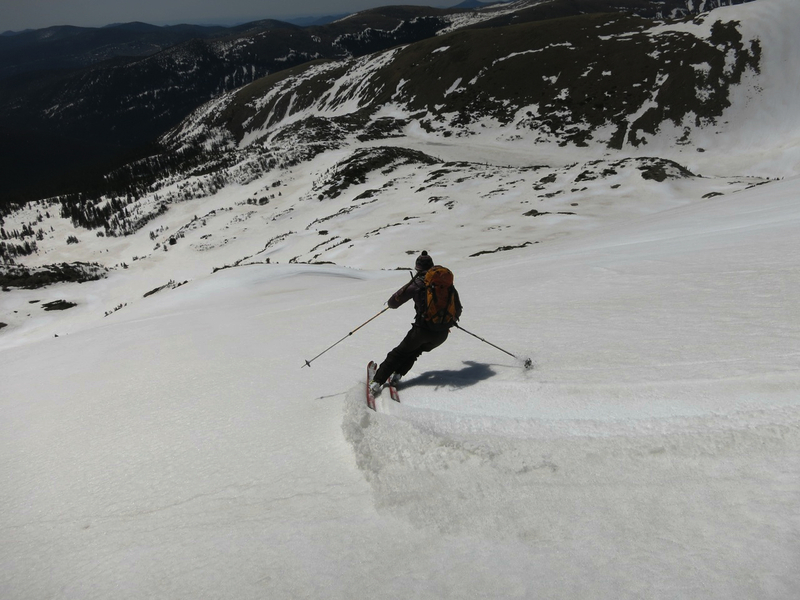 One of the things about spring skiing is when you’re hiking out, and you’re on a part of the trail where the snow has melted, and people are shocked that you have skis. Are common questions. Some ask with genuine curiosity, some ask with a slight sneer to their voice. And you smile and say yes, and know that if they are going for a hike of any length, they will wish they had skis.